It’s been 10ish months since we launched Automio. In that time, I’ve had some clanger rejections. I thought it was time to share a few of my top or most common rejections, and my thoughts on why lawyers and law firms shouldn’t be using these excuses. Zac: [Insert cheery smile ‘n’ dial introduction to Automio]. Well. What do we say to this? Yes, the changes coming to the profession will be fundamental - our Customer Success Manager, Olivia Wensley, recently shared her vision for the future in law in this blog. But in reality, tech advancements are not new for lawyers (e.g. telex machines, to fax to email). The key is to be an early adopter of new tech and to embrace it, so you can provide your clients with the service they demand (and deserve), and so you’re not left behind. Ah, the classic “we’re too busy to talk about things that will make us less busy” scenario. I understand it and I’m guilty of it myself. But it doesn’t take much reflection to realise it’s ridiculous in terms of future planning. We are all busy, but we need to make time to learn about alternatives. No one likes working 18-hour days. Technology exists to help us be more productive – to get more done with less human effort. There’s a bunch of cool legal tech out there – go and find out what might work for you! OK, so, nobody has actually said this to me, but it’s what I like to imagine when people flatly refuse to speak to us. 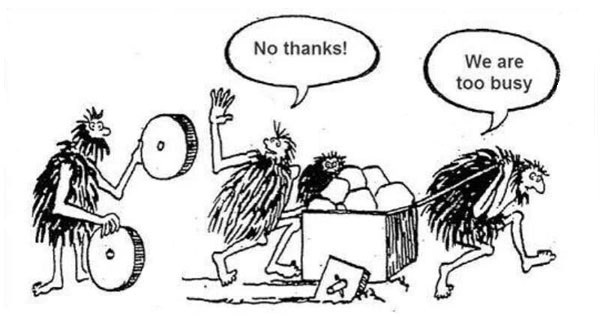 I’ve been amazed (and disappointed) by the number of lawyers who aren’t willing to spend 20 minutes speaking to us about a product that will make huge improvements to their life and their client’s experience. The lesson here is to be openminded and curious – if you’ve been doing something the same way for 20 years, there is probably a better way to do that same thing now. Newsflash: we can and do, and we’re making huge advancements with the use of AI, blockchain and logic mapping in the delivery of legal services. Lawyers will remain important but increasingly need to (and should want to) reposition themselves as strategic advisers. We are already helping lawyers around the world build automated self-service documents and advice. You can check out some of their success stories here. It will be in the strategic value-adds that lawyers will remain truly valuable to their clients. How do innovative lawyers react? Are you guilty of using any of these excuses? Have you heard any good ones? We’d love to hear them. If you’re interested in using lawyer bots to better serve your clients, check out this case study about an Australian law firm using lawyer bots to win new clients and serve clients online.